Dell EMC VxRail is the only fully integrated, preconfigured, and tested HCI appliance jointly engineered with VMware. 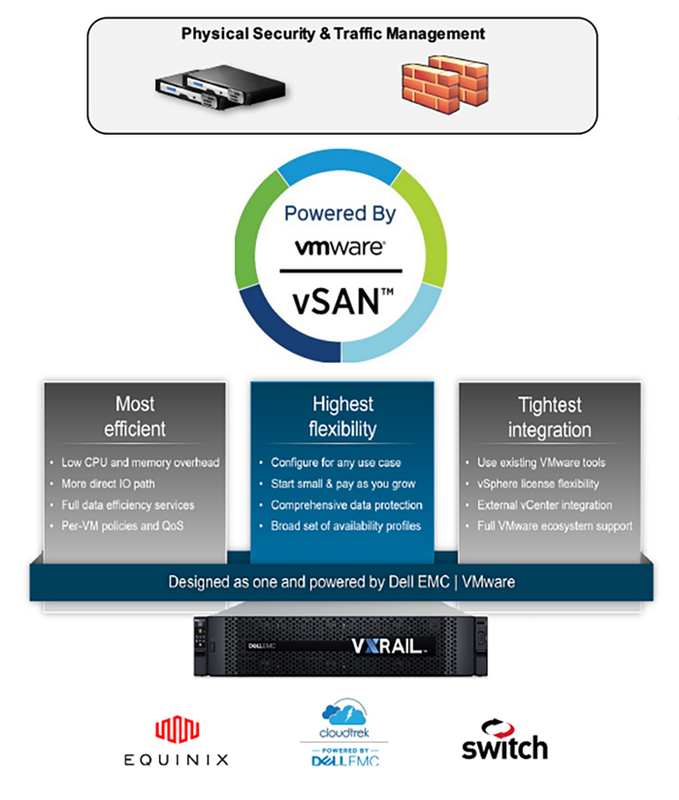 Powered by VMware vSAN and vSphere. Dell EMC VxRail built on 14th generation PowerEdge servers feature purpose-built configurations designed to support even the most demanding, mission-critical workloads and applications. With support for millions of configurations, including graphics processing, dense storage and high performance computing options, VxRail offers you the flexibility to choose the configuration that is best for your need. All-flash VxRail Appliances include efficient and in-line deduplication, compression, and erasure coding. RecoverPoint for VMs provides simple, efficient, and proven disaster recovery for VMware vSphere, protecting virtual machines at a granular level and ensuring business continuity. VMware Data Protection (VDP) protects every application or VM on the VxRail Appliance. Designed to integrate into the VMware ecosystem and utilize the management and orchestration tools, VxRail seamlessly integrates into your existing VMware environment for a familiar management experience. Day-to-day virtualization management is done within the familiar vCenter Server interface. Additional IT and Cloud automation can be provided with optional software like VMware’s vRealize Operations and vRealize Automation allowing you to seamlessly integrate VxRail as the foundation of your data center infrastructure.